Dikoff's top seller, D 028 Consistent C50, went home with Steven Bass, Brewster, Neb., for $22,000. Top selling bull of Rodney and Linda Dikoff's sale was lot #1, D 028 Consistent C50, a January 2015 son of Connealy Capitalist 028, for $22,000 bought by Steven Bass of Brewster, Neb. This bull had EPDs of CED 7, BW 1.9, WW 60, YW 103, CEM 7, Milk 19, $EN -2.48, $W 57.24, $F 59.93, $G 18.07, $B 107.27, CW 36, Marb .16, REA .77, FAT 0.036. Next up in descending order of top selling bull was lot #5, D 2217 Cardinal Rule C5147, a March 2015 son of S A V Hesston 2217 +, for $15,000 bought by Baxter Angus of Rockham, S.D. This bull had EPDs of CED 16, BW -1.4, WW 54, YW 82, CEM 12, Milk 22, $EN -0.93, $W 62.66, $F 30.84, $G 19.77, $B 100.42, CW 32, Marb .37, REA .17, FAT 0.039. 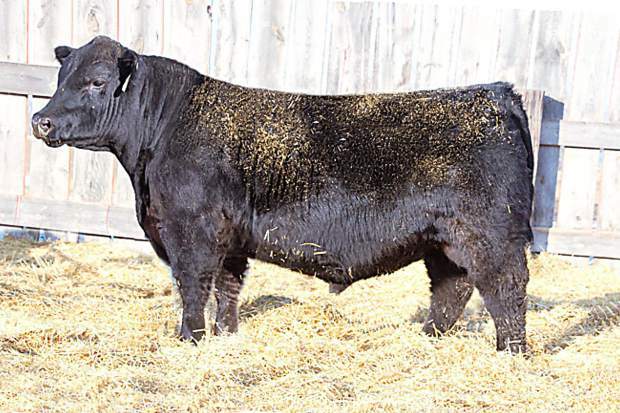 Third top selling bull was lot #3, D Rev Chunk C540, a February 2015 son of Connealy Revelation 2353, for $12,000 bought by Steven Bass of Brewster, Neb. This bull had EPDs of CED 8, BW 0.4, WW 59, YW 108, CEM 11, Milk 29, $EN -14.38, $W 73.54, $F 78.08, $G 47.04, $B 134.55, CW 31, Marb .37, REA .66, FAT 0.012. Lot #8, D Black Granite C528, a January 2015 son of Connealy Black Granite, for $11,500 bought by Hoffman Farms of Bowdle, S.D. This bull had EPDs of CED 1+11, BW 1.8, WW 62, YW 103, CEM I+12, Milk 29, $EN -24.16, $W 65.84, $F 58.98, $G 32.18, $B 132.29, CW I+41, Marb I+.56, REA I+.78, FAT I+0.050. Rounding out to the top selling lots of this sale was lot #6, D 797 Capacity C5131, a March 2015 son of SandPoint Butkus X797 +, for $10,000 bought by Hoffman Farms of Bowdle, S. D. This bull had EPDs of CED 12, BW 0.9, WW 67, YW 117, CEM 16, Milk 21, $EN -10.11, $W 69.76, $F 88.38, $G 24.39, $B 115.18, CW .32, Marb .40, REA .38, FAT 0.036.